Okay, so, I think we've established that fact that we are 99% vegetarian here at home. With the exception of my periodic drowning-of-imagined-sorrows in a bag of pepperoni, we stick to our meat-free choices fairly well. One exception to the rule is in November when I get a hankering for plates piled high with turkey and gravy. Judge at will! I totally understand. So, on to the actual deal! Not a bad deal for something I can easily throw in the crockpot and has 7 servings! Had I caught this deal earlier, there was also a $5 rebate from Checkout51 that had reached the limit by time I tried to add it. Ah, well! 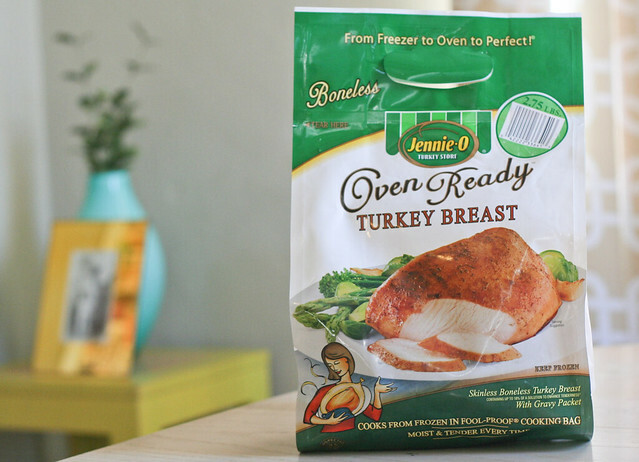 If you look around at your own local stores, you may be able to find the turkey breast for even cheaper than it was at Vons, to make it an even better deal for you. Let me know if you have any luck! Also, a note regarding Ibotta: I noticed they recently upped their cash-out limit to $10, which is quite a bit higher than their original $5. However, you can easily reach that limit if you take advantage of the above rebate and ask someone else to download Ibotta using your own referral link (which will earn you $5 once they complete their first rebate). There are currently a bunch of any-brand rebates (milk, cereal, eggs, etc.) so pretty much anyone who has a grocery list and a beating heart should easily find a rebate to take advantage of! I hear ya! I was in your boat for what feels like forever. :) I think the only reason they limit it to smartphone usage is that it would take crazy-long to take photos of receipts and have to upload them to your computer then email them. Come visit and you can eat some of this turkey! Deal? Deal.